The Wheeler United Methodist Church stained glass window is a focal point of the sanctuary. It enhances the worship service and illustrates a mixture of theology, scripture, and church history. It was designed by a former pastor and members of the church. There are nine panels in the window with information about each one listed below. The top-left hand panel of our window depicts the Apostle Paul. Paul is the author of many of the letters in the New Testament and is widely considered the historic leader of the Gentile churches. 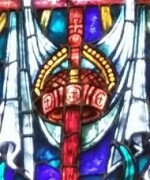 The depiction of a shield, sword and armor relate to the passage of scripture in Ephesians 6:11: the sword of Spirit, the breastplate of righteousness, and the shield of faith. The middle-left panel of our window depicts God's Word as contained in the Holy Bible. The flames represent the Holy Spirit and the fire that is the church as it remains committed to scripture as a primary way of understanding God. 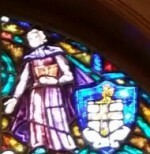 Bishop William McKendree is found in the lower left-panel of our window. He was the fourth Methodist Bishop (the first two being Thomas Coke and Francis Asbury) and the first bishop of the Methodist Episcopal Church born in America in 1757. Born in Virginia, Bishop McKendree served in the Revolutionary War. He encouraged growth of the church west of the Appalachian mountains. John Wesley was the main founder of the Methodist revival movement in England that spread to America. He is essentially one of the key father's of what is today called The United Methodist Church. In our window, John Wesley's arm is outstretched as he famously proclaimed, "The world is my parish!" The shield next to him depicts the Wesley's family coat of arms. Today, 70 million Christians worldwide trace their roots to Wesleyan heritage. Holy Communion is one of the two sacraments of The United Methodist Church. Baptism being the other. Holy Communion is more than just an act of remembrance, it is a means of grace and an opportunity for sanctifying grace. In the middle-right panel of our window, a chalice and grapes depict the blood of Christ shed for us and the bread and wheat represent the Body of Christ broken for us. Found in the upper middle part of our window is a symbol of the Father. The hand represents the Father as Blesser. The three extended fingers suggest the Trinity, while two closed fingers symbolize the two fold nature of God. The middle panel of our window depicts God the Son. The symbol of the cross represents Jesus dying on the cross for the sins of the world as well as the white cloth that Jesus' body was wrapped in. Below the cross are Easter lilies (not able to be seen from this picture) representing Christ's victory of Resurrection and that death could not subdue God. The Dove is found in the bottom-middle part of our window. In the Gospels (Luke 3:22) we are told the Holy Spirit descended at Jesus' baptism like a dove. In Genesis 8, after the flood, the dove is represented as a symbol of peace, bringing back an olive branch to Noah. Thus, the entire middle section of our window is represented by symbols of the Father, to the Son, and then the Holy Spirit (from top to bottom).